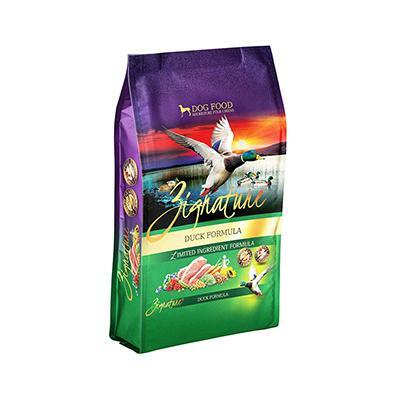 Zignature Duck Premium Dog Diet 4Lb. This limited ingredient food is great for dogs of all life stages. Packed with healthy antioxidants, veggies, fruit, duck, and legumes, your furry friend will not be able to resist this deliciously wholesome kibble. It is also gluten-free, making it an excellent option for dogs with dietary needs. Ingredients: Duck, Duck Meal, Chickpeas, Pea Flour, Peas, Sunflower Oil (Preserved with Mixed Tocopherols and Citric Acid), Flaxseed, Dehydrated Alfalfa Meal, Natural Flavors, Potassium Chloride, Salt, Choline Chloride, Minerals (Zinc Proteinate, Iron Proteinate, Copper Proteinate, Manganese Proteinate, Cobalt Proteinate), Vitamins (Vitamin A Acetate, Vitamin D3 Supplement, Vitamin E Supplement, Niacin, d-Calcium Pantothenate, Thiamine Mononitrate, Pyridoxine Hydrochloride, Riboflavin Supplement, Folic Acid, Biotin, Vitamin B12 Supplement), Blueberries, Carrots, Cranberries, Minerals (Zinc Sulfate, Ferrous Sulfate, Zinc Oxide, Calcium Carbonate, Copper Sulfate, Sodium Selenite, Manganous Oxide, Calcium Iodate, Cobalt Carbonate). Omega 6 Fatty Acids* 6.00% Min. Omega 3 Fatty Acids* 0.90% Min.